To keep skin looking healthy, you need to adopt a tailored skincare routine. If you want to enjoy a radiant skin, all you have to do is adopt the 10 essential beauty commandments! During the day, your skin is exposed to damage, and this makes it tired. Over the years, it changes. What it needs is plenty of pampering! Discover our beauty tips for beautiful skin at any age. Firstly, understand your skin type. Dry skin can feel tight throughout the day and may experience noticeable flaking. Dry skin is largely due to genetics, environmental factors such as lifestyle & diet, hormonal changes, and climate. Dehydration is also a leading cause of dry skin, so drinking plenty of water and avoiding diuretics like alcohol and caffeine can make a significant difference in how your skin feels and looks. People with normal/combination skin often experience dryness on the cheeks, making it important to find a moisturizer that is not too heavy but one substantial enough to retain moisture where needed most. Those with normal skin are not prone to breakouts on their cheeks and tend to have a well-moisturized t-zone. Excess oil can oftentimes leave pores congested and clogged. The happy news, however, is that oily skin looks younger and suppler because it has more natural moisture and is less prone to wrinkle. Use a creamy cleanser that is Soap-free before going to bed; wash your face with the cleanser thoroughly as part of your daily routine. Make sure you rinse it with cool water. Use a moisturizer on your face at least thrice a day to keep the skin hydrated and to avoid tightness and roughness of the facial skin. Applying a facial mask is also another great additional benefit to your routine, in which it helps rejuvenate the skin and makes it smooth. Exfoliate your dry skin using a slightly abrasive cleaner like a loofah or sponge. You may also use an exfoliating product that is suitable for your skin! However always remember to use natural products! Do not over exfoliate. Wash your face at least two times each day with a regular skin care face wash having pH similar to your skin pH. Always apply sunscreen with a large SPF every day. Apply a light lotion in the evening to keep your skin hydrated. To remove makeup use the same cleansing milk and a face wash.
Use an exfoliating scrub once in 2 weeks; thereafter use a non-drying face mask. Cleanse it! Find a cleanser marked specifically for oily skin. It will prevent your skin from looking like an oil slick without stripping it of necessary oils. Use a foaming face wash which contains alpha hydroxy acids, salicylic acid etc. This should be used 3-4 times in a day and followed up with an alcohol-free toner. Use non-comedogenic wide spectrum large SPF sunscreen for oily skin. Use only water based makeup. Use of an exfoliating scrub weekly and anti-acne mask if you have an acne problem. Having great skin is a desire of many and when it’s summer, a lot of us want to make sure that our skin is clear and radiant. 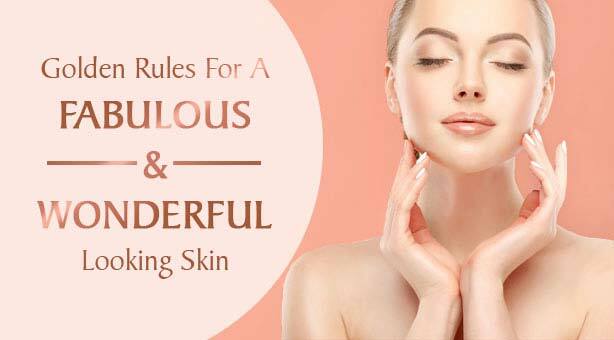 If you’re striving for a better-looking skin, the above-mentioned golden rules of skin care will help you achieve glowing skin in no time!